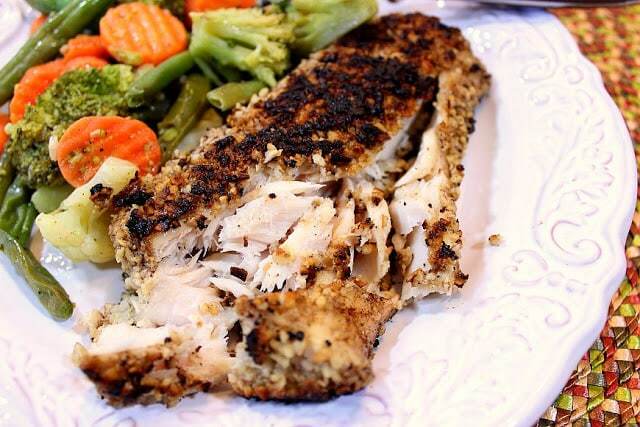 Cashew Coconut Crusted Mahi Mahi is the perfect balance of flavors and textures. It’s crunchy and tender, sweet and savory. I have a confession to make: I don’t prepare fish fillets all that often. It’s not that we don’t love fish here at my house, it’s just that my mind doesn’t always gravitate to it when I’m planning dinners and grocery shopping lists. Mahi-Mahi is by far my favorite fish to prepare and eat so the last time I was at Costco I purchased a big bag of frozen mahi-mahi fillets. Even though the fillets were pricey, I figured that we’d get at least two or three meals (including leftovers) out of that one big bag. As I was running a few preparation scenarios around in my head the night I decided to prepare the fish, I remembered that I had some raw cashews, and also some unsweetened coconut in my freezer. 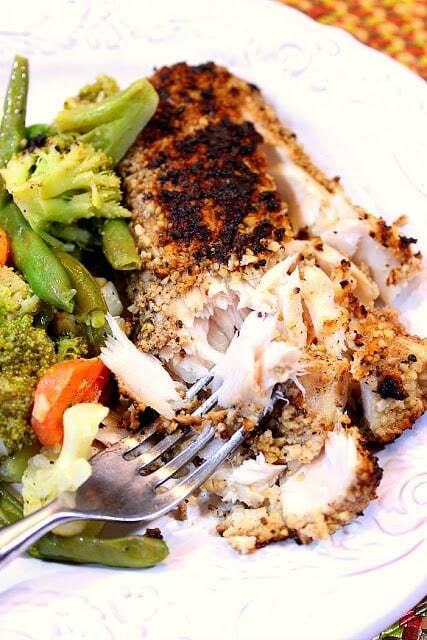 Since mahi-mahi is naturally sweet in flavor, using unsweetened coconut is key to the success of this recipe. In my opinion, using sweetened coconut would be much too sweet and would overpower the delicate sweetness of the fish itself. Since I only had raw cashews in my freezer, that’s what I used. However, in this particular instance, I do believe that salted, roasted cashews would work swimmingly well. Get it? Fish humor. With only a few quick pulses in my food processor, my coating was ready for the fish, and I was excited for dinner time (as I usually am. HaHa)! *Note – After coating the fish with the nuts and coconut, chill for at least 20 minutes as this will help the coating adhere to the fish during the cooking process. -Place the cashews, coconut, 1 teaspoon salt and ¼ teaspoon pepper in a food processor and pulse until the mixture resembles breadcrumbs. -Place the crumbs into a shallow dish, and in separate shallow dish mix together the cashew milk, egg, ½ teaspoon salt and ¼ teaspoon pepper. 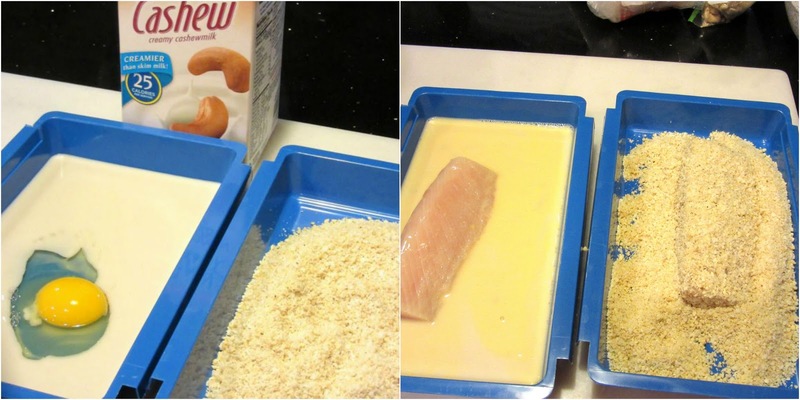 -One at a time, place each fillet in the cashew milk mixture (turning to coat) and then into the cashew and coconut mixture, making sure to press the nut mixture firmly onto both sides of the fillet. Place the coated fillets on a baking sheet. When all the fillets are coated, refrigerate for at least 20 minutes. -In a large saute pan, heat the oil over medium heat until it shimmers. 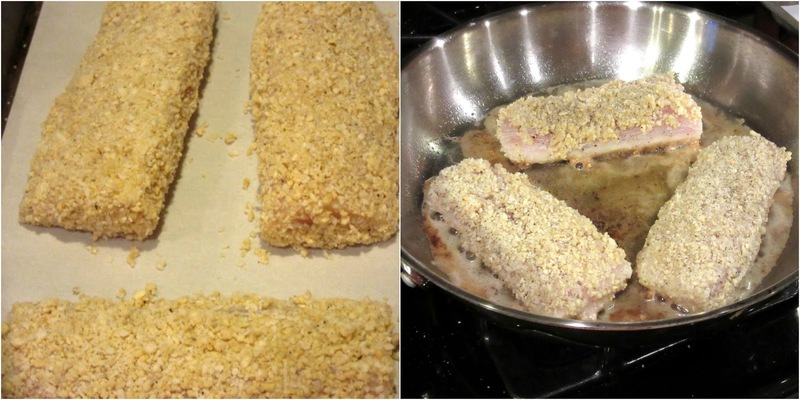 Add the coated fillets and cook until golden brown (approximately 4-5 minutes). Flip and cook for an additional 4-5 minutes until golden brown. 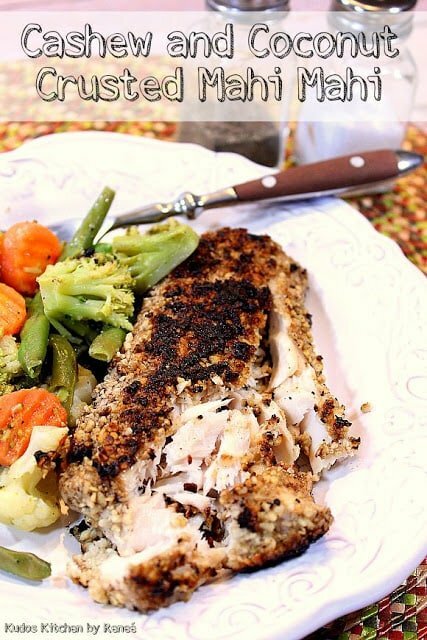 My husband and I both enjoyed this Cashew and Coconut Crusted Mahi-Mahi immensely. Since it’s only the two of us I’m cooking for these days (yes, we’re finally “empty-nesters”), we had plenty for dinner that night. Plus we both had leftovers for the next day’s lunch. YAY! Now I just have to figure out what I’m going to do with the rest of the bag of mahi-mahi but I don’t suppose it will be all that hard to figure out. After all, when you start with a delicious blank canvas (aka the mahi-mahi), the rest comes easily. 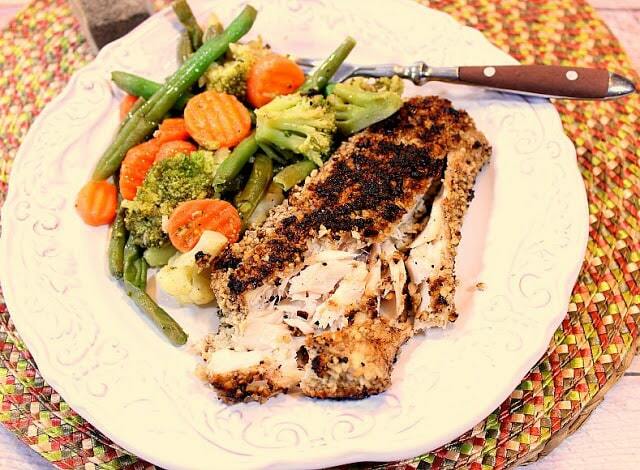 Speaking of delicious mahi-mahi recipes, check out this one that I shared a few months back. It’s another one of my favorites and is perfect for a light, refreshing meal. If there is ever anything I can paint for you, from glassware, to aprons to tea towels, please don’t hesitate to contact me or visit my shop on Etsy. Custom orders (like the bride and groom scuba divers) are always welcomed, and always encouraged. Mahi Mahi is also my favorite fish! I have never tried it at home and I love how easy you made it look. I don't make much fish at home either but this sounds easy enough I'm going to have to try it. What a lovely coating for the mahi-mahi. Love the mix of cashew and coconut. I am not sure I've had mahi-mahi. I'm adding it to my foodie bucket list. The crust looks perfect. Sounds like it would work well w/ chicken too. This looks delicious! We make seafood all the time – definitely trying this coating the next time we cook some fish! We buy that mahi mahi at Costco often. It's fantastic to have on hand for easy meals! I love the idea of crusting them with cashews and coconut. I cook fish at least once a week but it's usually salmon. 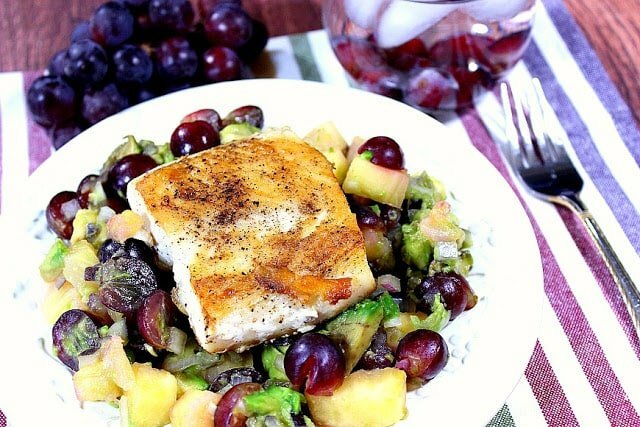 this mahi mahi looks delicious and I love the idea of using cashews to coat it!